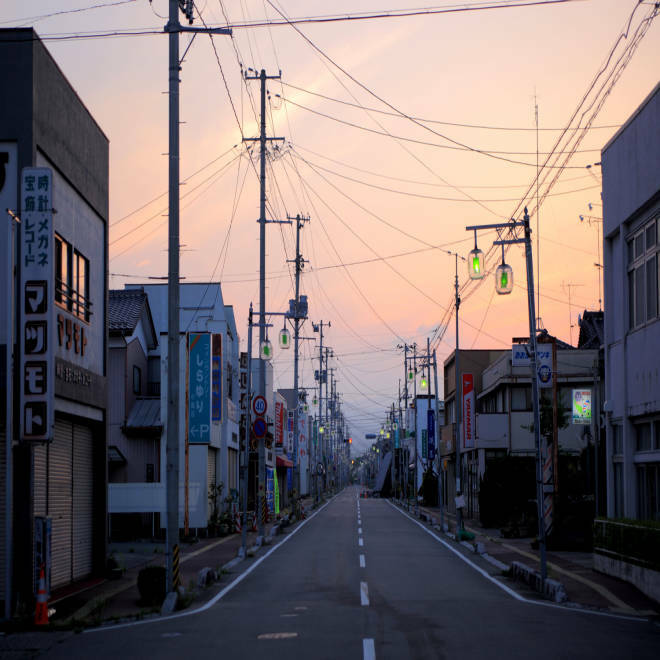 Odaka, Japan, resembles a ghost town at dusk. ODAKA, Japan -- The main street is deserted and quiet except for the eerie echoes of music being played somewhere in the distance. Pieces of shattered glass lie scattered along sidewalks outside collapsed buildings, some with their second-story roofs smashed flat on the pavement. Yards and driveways are overgrown with weeds, and schools and playgrounds are silent and forlorn. Welcome to Odaka, a Japanese town of about 13,000 residents before a triple disaster of earthquake, tsunami and nuclear meltdown that began on March 11, 2011, turned the once-charming coastal village into a ghost town. 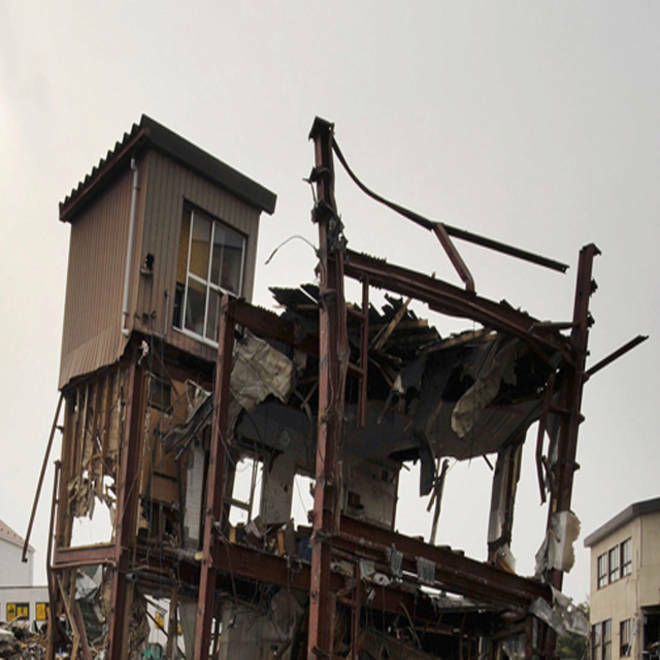 While many other Japanese towns and cities suffered the first two calamities, Odaka, which is in the southern district of the larger city Minami Soma, is unusual because of its proximity to the Fukushima Daichi nuclear power plant -- just 6 miles from the southeastern edge of town. The plant, which suffered meltdowns in three of its four nuclear reactors and breaches of its containment walls after the quake, emitted a plume of radioactive smoke that at times drifted over – and through – Odaka’s streets over several months. As a result, the town was frozen in time for more than a year after the disaster, abandoned in the so-called “exclusion zone” established by Japanese authorities around the Fukushima plant. Aside from a hurried search for bodies and a few perfunctory cleanup efforts, it remained untouched until April 16, when authorities narrowed the exclusion zone from 20 kilometers to 10 kilometers (6.2 miles) to the north of the plant and allowed residents to return to begin picking through the moldy, shattered and irradiated pieces of their lives. As the town slowly begins stirring, it offers a preview of the challenges and travails that await other communities even closer to the plant – if and when they are reopened. Hotel owner Tomoko Kobayashi is slowly emptying her former business and residence of keepsakes. In the meantime she has her hands full chasing out stray cats and cleaning up after an uninvited boarder left empty bottles of liquor scattered in an unkempt room. Among the first wave of returnees was Tomoko Kobayashi, the owner of a small hotel, who has begun cleaning up her business despite the fact that no customers are likely to be ringing the bell at the front desk anytime soon. Kobayashi, a petite and energetic woman in her 60s, is a third-generation hotelier who took over the family business 10 years ago and had expected it to provide a steady income after her husband’s retirement later this year. But now, between drives of 40 miles each day to and from the couple’s cramped temporary housing unit in Haramachi, she worries that Odaka will never recover, as many business owners and young people elect to start new lives elsewhere. While Minami Soma city has begun decontamination and reconstruction efforts, Odaka remains under the direct authority of the Japanese government. That means residents must wait for evacuation orders issued shortly after the quake to be rescinded before they can return full-time. For now the town is open 24 hours a day, but no one is allowed to sleep there. 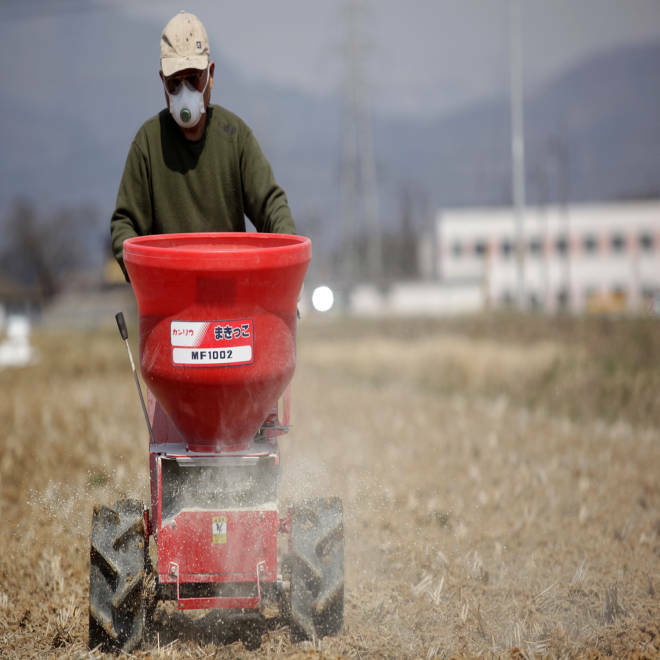 On the outskirts of Fukushima city, a farmer spreads zeolite -- intended to absorb and concentrate radioactive cesium -- across his rice field in preparation for planting. Because many residents were forced to relocate far from Odaka, relatively few return on a regular basis to sort through their belongings and begin cleaning the tsunami mud and debris from homes and businesses. In their absence, police and volunteer patrols circle the streets, politely questioning anyone who stops and sometimes searching vehicles if they suspect theft. The occasional work crew repairs telephone and power lines or fills potholes with gravel. Farms and fishing – once the lifeblood of Odaka – are not going to contribute to a recovery for a long time. Massive swathes of farmland are contaminated by tsunami salt or radiation and the fishing industry has been obliterated. But while damage from the quake and tsunami were substantial, radiation remains the main cause of concern both for the government and Odaka residents. Tatsuo Miyamoto of the Minami Soma City Reconstruction Department said the reopening of Odaka is “a move to start cleanup in preparation for residents (to) return” once electricity, water and sewage service are restored, he said. View side-by-side the progress that Japan has made since the tsunami and earthquake in March 2011. In the meantime, he said, the government believes that radiation levels in the town are safe for “extended exposure,” which it defines as up to 20 millisieverts per year – the same level that the International Commission on Radiological Protection has established for nuclear workers. But it is conducting a thorough survey of the town in 30-meter increments to measure levels in individual plots, which will then be classified as “prepared for return,” “problematic for return” or "prohibited for residency for an extended period.” That survey will determine where decontamination work – such as soil removal, high-pressure spraying and other measures – is required and which parts of the city – if any – will remain off-limits. But decontamination efforts, which were scheduled to start this month and continue at least through the end of 2013, already have been delayed because sites for disposal of Odaka’s radioactive waste have not yet been approved. That leaves early returnees like Kobayashi in a bind. Bags of radioactive tsunami mud collected by volunteer workers remain piled along the sidewalk outside her hotel in a tidy line. “I keep telling them to take it away, but they won’t,” she said, referring to government workers who drive past each day. Test rice paddies are scattered throughout Minami Soma. 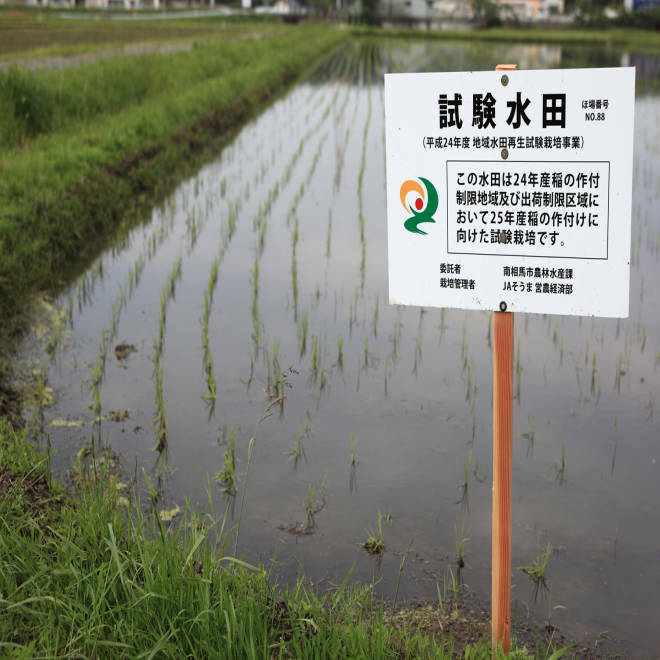 The rice will be harvested and tested for radioactive cesium later in the year. Questions also are being raised on the efficacy of decontamination efforts. The Fukushima Prefecture government said that its work in the field indicates that overall radiation levels decline by 37 percent with decontamination work, which may not be sufficient to make highly contaminated areas suitable for habitation. And areas that are cleaned can be recontaminated by radioactive materials carried by wind or water. Despite the radiation already in the city, many Odaka residents and some nuclear energy experts are more concerned about the safety of the battered Fukushima Daichi plant. The Japanese government and the plant operator, the Tokyo Electric Power Co., or TEPCO, have assured the public that the plant is stable and that safety systems are being restored. 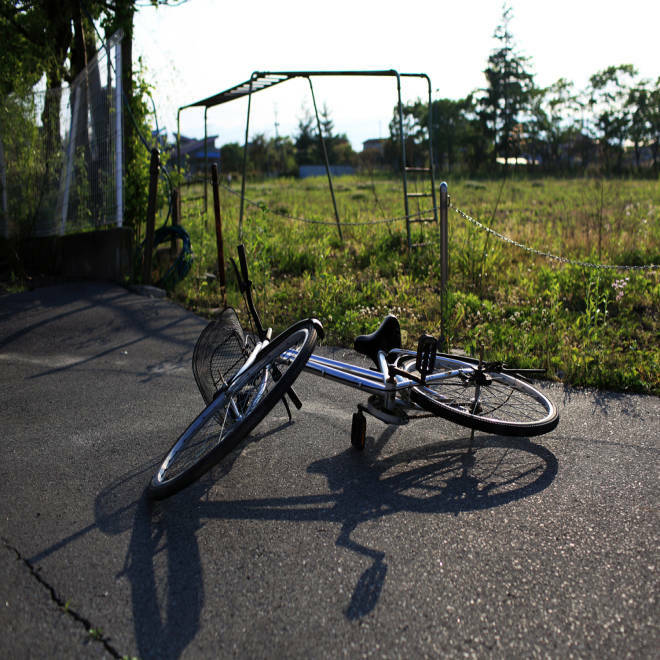 A bicycle lies abandoned at a local elementary school in Odaka. But Takahashi Kei, a former cooling system worker at the plant now working as a radiation survey volunteer, said the utility company’s executives are portraying the situation in the best possible light. “There are leaks everywhere, wreckage too. It’s not as simple as they portray,” he said. 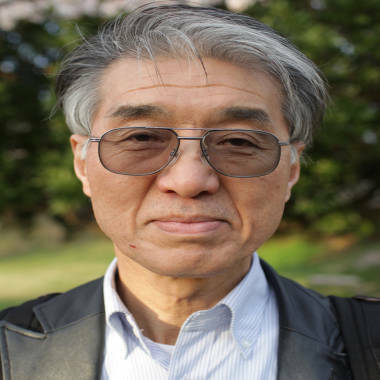 Nuclear reactor specialist Hiroaki Koide. TEPCO acknowledges that three reactors at the plant remain full of melted and re-solidified fuel that must be removed and that spent fuel pools elsewhere on the grounds must be kept cool to prevent them from releasing radiation again. It estimates it will take about 40 years to completely decommission the site. Others see the situation as more dire. Ultimately, financial pressures may be the deciding factor in whether evacuees return to Odaka. Under current government standards, residents are eligible for property compensation only if evacuation orders stay in place. If the orders are rescinded, they must decide whether to shoulder the loss and walk away from their homes and businesses or return face possible radiation exposure and the danger posed by the damaged nuclear plant. What was once a gleaming city full of good jobs, new schools and modern apartments is now a ghost town infected with radiation. NBC's Michelle Kosinski reports. Such agonizing mental calculus is evident in the repopulated Haramachi district north of Odaka, where many parents restrict their children to playing indoors, or in school yards or gymnasiums that have been decontaminated. And despite widespread availability of health tests and full-body scanning, many residents are concerned about food contamination, as well as airborne dust and sand that they fear may contain radioactive material. Nearer the epicenter of the nuclear nightmare, in Odaka, such fears are bound to be amplified. And in a town where 28 percent of the population was older than 65 before the disaster, that has Kobayashi questioning whether her hometown can survive. Click here to sign up to receive our Top News email each day.